For some people, baking a perfect cookie is a difficult task that requires careful consideration and ample practice. While some people prefer cookies that are thin and crispy, others like them soft and chewy, while still others prefer a combination of the two. No matter how you enjoy them, the ingredients you use ultimately determine the flavor, texture and consistency of the cookie. In fact, making a simple switch between butter, shortening and margarine while baking cookies can have drastic effects on your final product. Shortening has the highest melting temperature. When the cookies are baking, the dough is able to hold its shape for longer before the shortening begin to melt. As a result, the flour and eggs have time to set in place before the cookie begins collapsing. Margarine and butter only have slightly different melting temperatures, so they offer a similar amount of spread. Using them in your recipe often causes the cookies to spread much more extensively during the baking process. This usually results in flatter, crispier cookies -- and if you're not careful, they will easily burn to a crisp if baked too long. To prevent cookies from spreading too extensively, freeze the dough on the cookie sheets before popping them in the oven. Margarine and shortening deliver essentially zero flavor to your cookie recipe. Butter, on the other hand, delivers a delectable taste that cannot be matched by any other ingredient. Although you can use butter-flavored shortening, it does not quire replicate the taste of true butter. When making your decision based on flavor, simply choose the option that most pleases your tastes. In one tablespoon, both butter and stick margarine deliver approximately 100 calories, tub margarine roughly 60 calories and shortening 110 calories. All three options are quite high in fat, ranging from 10 to 15 calories per tablespoon. Butter is highest in saturated fat and cholesterol, which can clog the body's arteries. On the other hand, margarine has both saturated fat and transsaturated fat. Trans fats raise LDL cholesterol levels and lower HDL cholesterol levels, making them even more dangerous than saturated fat. Although shortening does contain saturated fat, it does not have any cholesterol. In regards to the nutritional aspect of the comparison process, all three options have advantages and disadvantages when baking cookies. 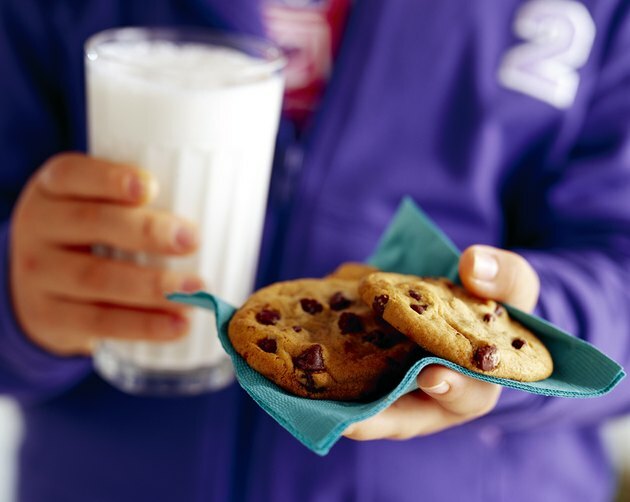 Although it might be nutritionally beneficial to choose the option with the lowest fat content, the cookies' taste and texture will be impacted. Whether you use butter, margarine or shortening, it is essential that you use the appropriate form recommended in the recipe. For example, if the recipe calls for melted butter, use that form only. Using solid butter or boiling it to a thin liquid will significantly change the ultimate texture of the cookie. Similarly, if the recipe calls for room-temperature margarine or shortening, be sure to pull the product out of the refrigerator several hours before you plan to bake the cookies. O Chef: What's Better: Butter, Margarine, or Shortening for Cookies? Providence Health &amp; Services: Ask an Expert: Butter vs. Margarine – Which Is Better For You? Why Do My Chocolate Chip Cookies Go Flat When Baked? Can I Replace Butter When Baking Cookies With Vegetable Oil?